Looking for London Wedding Photographer reviews? Well here is a page I set up with all the great reviews left by couples I have worked for. 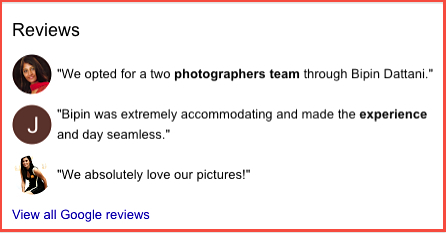 Good Wedding Photographer Reviews are the essence of a wedding photography business. Valuable review, testimonial, evaluation and appraisal feedback from the brides & grooms I have photographed is always appreciated. Kind words from clients and guests go a long way showing all the effort I put on the wedding day is appreciated. A client’s local photographer reviews, analysis, evaluation, assessment, appraisal, examination, study are alway appreciated. It’s the only way to grow a business. Some couples that got married in and around London have been kind to give testimonials. Reading some nice things some of my couples have said about Bipin Dattani Photography.